for which it stands: one Nation under GOD, indivisible, with Liberty and Justice for all. Mansions of the Lord, view HERE. 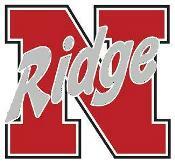 Visit Northridge Deceased Alumni Veterans Memorial website here. 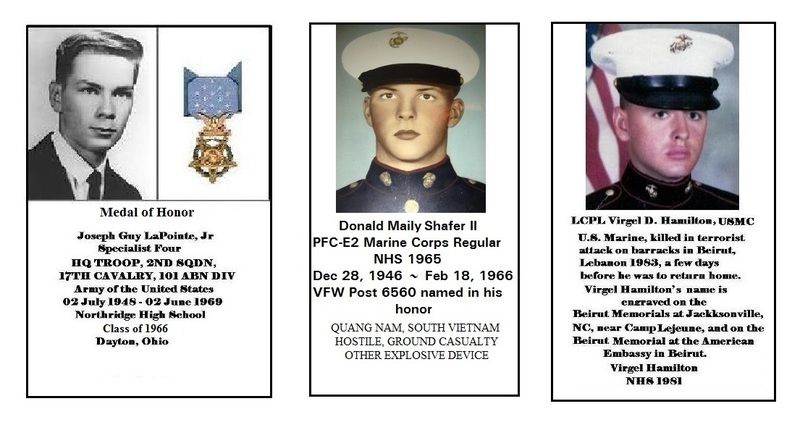 A Northridge alumnus proposed a NHS Alumni Veterans Memorial to be erected on the grounds of the Northridge Stadium to the Board of Education on July 09, 2012. The Board of Education approved the proposal on August 13, 2012. The start of construction was on May 30, 2013, with the digging of holes for fence posts. The first phase of construction was finished on September 19, 2013 and the second phase was completed on July 03, 2014, see photo above. 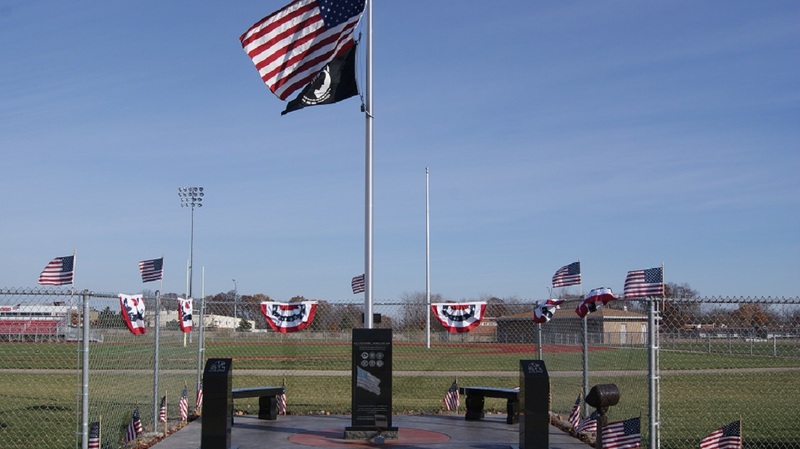 A black granite lighted memorial with matching benches and flag pole, was erected. The names of deceased NHS alumni veterans are and will be etched onto the monument. The memorial is financed by donations. New names will be added in groups. Information is needed about NHS veterans. Add A Name And Help Build This Page. To add a name to this page please, complete the information form HERE for any Northridge alumni veteran. If you are or know alumni* who are veterans and not listed below, please use this form HERE to send your or their information to be included. Use this form also for corrections and additional information that can fill in the blank areas of the list. Thank you and thank you, NHS alumni veterans, for your service to our great country. * A Northridge alumni is anyone who ever attended a Northridge school. The present cost to add a name to the memorial is $25 to $30 depending on the number of letters in the name. All cost are paid for by donations. In order to keep the cost as low as possible, names are added in groups. Please consider making a donation to the NHS Alumni Veterans Memorial. 100% of donations will be used for the continued support of the memorial. All administration costs are done free and voluntarily. Honor our NHS alumni service veterans with your donation today. Thank you. PLEASE SUPPORT THIS ALUMNI VETERANS MEMORIAL WITH YOUR DONATION IN ANY AMOUNT. Don't let the our NHS alumni veterans go unappreciated and unrecognized. 1. Mail a check. Click here to print a donation form. 2. For convenience you may donate online here. Those who deserve a special THANK YOU. Exceptional Alumni - Bill Sandifer 1953, Phill Wilson 1958, Barbara Kimmel 1960, Duane Tron 1962, Phyllis Richards 1962, Jerry Badders 1965, and others who made donations to make the memorial a reality. Withdrew 01/22/1966 PFC 4th Arty. Cpl. Bridge Co. 7th Engr. Bn. SP/4 Co. B 2nd Inf. 1st Inf. Div. 9th D. C. Co. 1st O. R. Regt. Corp. 2nd Plt. C Co. 1st Tank Bn. *Six groups of deceased veterans have been added to the memorial. Group seven will be added when enough names are listed to make it cost effective. next list of names will be added without a delay for lack of funds. Donation information is listed above. form HERE for any Northridge alumni veteran not on the list above. Also use the form to submit corrections to the list. Sixty-seven years after U.S. Navy Petty Officer McPherson "Mac" Plecker nearly starved to death as a Japanese prisoner of war, he finally got the recognition and medals he earned. "I knew I was due some medals, but I really never paid too much attention to it," said Plecker, 91. "I really didn't think after all this time I was going to get them." But on Saturday morning, the World War II veteran was driven by stretch limousine to the Palms of Largo retirement community for a stirring medal award ceremony in front of about 150 guests, mostly veterans. 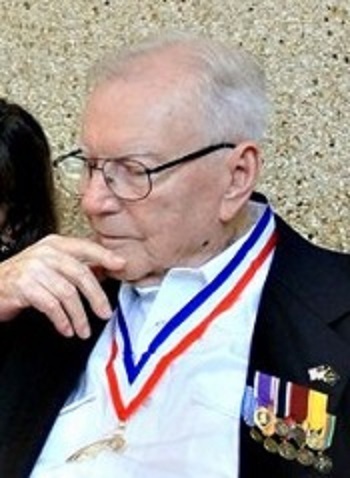 Nine medals were pinned to Plecker's black jacket, including the American Defense Service Medal, a Purple Heart and a Prisoner of War Medal for imprisonment between 1941 and 1945. During those years, Plecker suffered beatings and torture. He survived by eating rats, boiled weeds, raw fish heads — even a can of shoe polish. Now he has lung cancer, and it was his Suncoast Hospice team, with assistance from former U.S. Rep. Mike Bilirakis' office, that pushed to get the medals he deserved. Daphni Austin, veterans relations liaison for Suncoast Hospice and director of Honor Flight of West Central Florida, told the crowd Saturday that she was struck by the first thing Plecker did when he returned home to the United States. "He went and bought a Navy dress uniform. . . . To me this was a true statement of this man's loyalty and pride as a member of the U.S. Navy. After everything, what was important to him was to get back into uniform," she said. That uniform had to be tailored — he weighed just over 80 pounds when he was released from prison camp. Plecker joined the Navy in 1940 and achieved the rank of machinist mate third class. He was stationed at Wake Island in the Pacific when the Japanese launched an air attack shortly after bombing Pearl Harbor. Shrapnel from bombs tore into Plecker's chest and left arm. He still carries scars. On Dec. 23, 1941, two weeks after the initial attack, the Americans were forced to surrender. Plecker's personnel and medical records were lost during the invasion. Plecker would serve the balance of World War II in prison camps in China and Japan. After he was discharged, he went on with his life, owning a car lot for three decades and then a drive-through beverage store. He never pursued the decorations to which he was entitled. "It was just something he didn't really ever talk about," said his daughter Mary Gerrity, 48, of Tarpon Springs. "He's a very humble man." Even today, the memories of his years as a POW still cause him pain. "It's something I'd just as soon forget," he said. But his recollections will live forever. In 2002, Plecker gave a recorded audio account of his military history to his friend, Clearwater attorney Carleton "Woody" Weidemeyer. It is now archived at the Library of Congress as part of the Veterans History Project. In telling his story, Plecker recalled the first wave of bombers to fly over Wake Island. "They were not much more than 100 feet off the ground," he said. "There wasn't much to do except run." After the Americans surrendered, he was taken to an airfield, where his hands and neck were bound by wire to those of other prisoners in a daisy chain formation. He recalls being kept on the airfield for three days with no food and only "gasoline water" to drink. (The prisoners were given water from five-gallon gas cans that had not been rinsed out.) Food rations over the next four years consisted of fist-size balls of rice and "soup" — hot water with a bit of vegetable juice in it. The POWs were beaten for no reason, he said. Sometimes they were used by the Japanese for martial arts practice. Many died from exposure, malnutrition, diarrhea and pneumonia. By Sunday, the precious medals Plecker had received the day before, along with an American flag flown over the U.S. Capitol, were under glass, "where my dad can look at them every day," said Gerrity. She said her father was tired out after all the pomp, but "still spunky." The nonagenarian lives independently in his own home in North Pinellas and drives a brand new red Chevy Camaro. Still, he remains humble. "It's nice to know people haven't forgotten us," Plecker said. U.S. Navy Petty Officer McPherson "Mac" Plecker passed away on the tenth day of July, 2014. Visit the memorial website for NHS deceased veterans HERE. To see available pictures of all known NHS alumni veterans, CLICK HERE. See the "Return To Vietnam, Healing On The Hill". Remember, freedom isn't free. Thousands have paid the price, they gave up their tomorrows for your todays. GOD OUR FATHER, WALK THROUGH MY HOUSE AND TAKE AWAY ALL MY WORRIES, WATCH OVER AND HEAL MY FAMILY, PROTECT OUR FREEDOMS, AND WATCH OVER OUR TROOPS, WHO ARE DEFENDING THOSE FREEDOMS. In the US, this practice became common during the Vietnam war, due to the political divide in the country over the war; leaving a coin was seen as a more practical way to communicate that you had visited the grave than contacting the soldier's family, which could devolve into an uncomfortable argument over politics relating to the war.